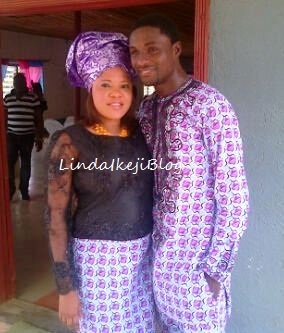 Actress Toyin Aimakhu and her man, Tinsel actor Adeniyi Johnson got married today at a registry on the Island. The couple got engaged in December 2012 after dating for almost a year. Big congrats and happy married life to them! Congrats o but is that a Bang Belly abi na eba she eat full belle so? Congratz to them. Happy married life. Obiviously she get belle. But congratz to dem still. Congratulations to them and I wish them a happy married life!!!! Congratulations to the them and I wish them a happy married life. Congrats to Toyin& her hubbyMay God bless your home. Oh well..... She finally got it ryt! A big congrats 2 them!linda u ar alwayz on ponit! IS IT NOW A TREND TO NOT DO WHITE WEDDING IN NAIJ? Congrats girl, may God bless your home. ahn ahn! So fast. Smh. Goodluck sha. Na wa o. Biko what does this girl have that I dont have. This is her 2nd marriage to a "decent" guy and I cant even bag 1 half decent guy. Na wa o.
Biko is dis wat dey wore? If so #fail! I can see a baby bump.... Congratulations!!! It shall be frruitful. Looks as if she is pregnant. Please his face dosent look familiar to me. Please can somebody tell me d role he plays in Tinsel. I'm happy for her oo......but why she go marry my name sake.....Niyi Johnson.....lol. So happy for you guys, may God grant you happiness and make this union a blissful one. You guys should just know the way to a blissful marriage is patience and love. No third party pls.cheers best of luck. Congrats dear. I wish you a fruitful marriage. 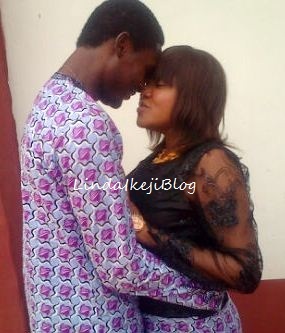 .....Congratulations Toyin!buh is she pregnant??? ?Just askin cos of d second pichore"
Na wetin em wear go registry b dis???? ?she luks pregnant BTW......nyways happy married life! Iru imura wo wa le leyin? W̶̲̥̅̊н̣̣̣̝̇̇̇@̤̥̣̈̊̇†̥̣̣̣̇̇̇ kind ☀̤̣̈̇F dressing Ȋ̊§ ds....on wedding day? I dnt think S̲̅Ơ̴̴̴̴̴͡.....maybe linda J̲̥̅̊u̶̲̥̅̊s̶̲̥̅̊t̲̥̅̊ use ds one to announce dem here! Anywayz congrats to D̶̲̥̅̊ both ☀̤̣̈̇F U̶̲̥̅̊! Linda! See u!! Remix of baby jowo has bn out n u ddnt put it here. Congratulations. I hope this one lasts for Toyin. Congratulations Toyin and Johnson...happy married Life. Weekend Getaway (Trailer) Starring Genevieve Nnaji, Ramsey Nuoah, Ini Edo, Monalisa Chinda, Uti Nwachukwu, Bryan Okwara [Directed By Desmond Elliot]!! Yeah happy married life to this lovely couple!! Love the lady's acting,she's very funny. Can't wait to read LIB'ers comments and criticisms. Gorgeous guy. Hope they have a fun-filed and joyous marriage. ‎​ℓ̊ L√e Toyin, congrats sis! ЂąppƔ married life, GOD bless ‎♈☺ΰr union with ‎​​Ĝ∞∂ children + all ‎​​Ĝ∞∂ things. Cute couple, wish them marital bliss. Nice but abeg, wetin Toyin wear so? A big congratulations to them...may God bless their marriage! Can't wait for Linda's verdict. Linda post my comment,abi wetin I do u?may d marriage last 4eva.I don't want 2 hear stories oh!!! Never seen this guy on tinsel, who does he play? Ivory Chi, the lady with the caps font. Who told you that? Anybody can do as they dem it fit. It's not everyone that likes all the paparazzi that comes with white wedding. Sorry about that. Yours is on his way. Like the Yorubas will say "Ori yato sori." And so? Just say your own congrats and move along, tnx. We can't all be alike, think alike and act alike, gerrit? You think say na everybody like laolao spending and gongo aso wedding? Is it a crime for her to marry her heartthrob because he bears same name as yours? My dear, people no get time to dey do laolao spending jare. Do what is convenient for you and save for your future. What is wrong with the style? when one finds his or her life partner,pple must always talk. U guys saw and like each other jst pray to God for things to wrk out well 4 u both,4get abt wht pple say. Happy married life to u both. Walahi! I tire for the gurl! Replying everybody, abeggi goan sidon jor! Congrats my toyin, i pray ur home will be filled with much blessing. All d aprokos pls find something else to do if u cant wish them well. Toyin may dis marriage comes with multiple favour. HML dearie. I wish u all d best toyin. Ur marriage shall be a blessing, ur children surround ur table, u shall see ur children children do says d lord of host.